If purchasing this seed mix, print this page and keep it as your reference. Ideally suited to shallow peaty soil mixed with clay topsoil or loams of an acid base this mixture will flower all summer. MM11 should be cut at least once per year. Do not let any stock on it in the first two years or they will damage it as the heather is delicate when young. The annual Corncockle has noxious seeds, one of the many reasons for it not to be grazed by stock until the winter of year two, when all the annuals (Corncockle) will have totally disappeared. Most annuals only flower for one year on untilled soil.. Origin: Native Irish Origin, Wildflower Seed Mixture. Moisture Level: Not for dry soil, unless well drained in high rainfall areas. suits moist free draining soils but not flooded wet. Life Cycle: Annual / Biennial / Perennial. Flowering Period: May to August. Fertility Range: Will grow on any soil, suits mildly fertile top soil. The less fertile the soil, the less cutting will be required. This photograph is one day in the life of an ever changing meadow. Product Warning: DBN recommends that this mixture is not for human or animal consumption. Soil Preparation: Normal, create firm, fine tilt on seed bed, if clay, ensure a fine tilt or press the seed into clean soil. Optimum Sowing Time: Spring, early autumn, when the soil is warm. Sowing Conditions: Normal, roll or rake into surface to keep out of reach from birds. Sowing Method: By hand is recommended, if using seed spreaders be careful to insure the small varieties of seed do not drop to the bottom of the seed spreader and get sown all in the one place. Can be Hydrasown. Yes. Normal sowing rate 'without added grass seed':1.5 grams per metre. High sowing rate 'without added grass seed': Add 3 grams per metre. Nurse Crop: No nurse crop is required. Sowing rate with grasses: 2 to 7 grams per metre depending on the percentage of grass. If sown without grass seed, this mixture: Will not require a nurse crop. In normal conditions (mainly in early Autumn and Spring) this mix should germinate 3 - 6 weeks after sowing, from then on, provided the sward is kept open and a 'Thatch' is not allowed develop, species will continue to germinate and emerge, through to the third year. The annuals supplied in this mixture May flower, provided they are sown before June. This mixture requires one cut when finished flowering. If this mixture was not cut in first year, cut and remove foliage in early Spring, before the biennials grow. Cut again in July, August or September, depending on when flower finish or the level of weeds that emerge. In the third year this meadow mixture will seem to have less flora than the first and second year. Why? The perennial species are still young, many will only have germinated in the second season, so flowers will be sparse. However, there should be identifiable foliage and some flowers. If not contact us. In the fourth year, when the perennials in the mixture should be flowering on many stems and starting to clump and spread, again if the grass is still vigorous cut in spring and in August of the fourth year. However if the perennials are growing strong there will be no need to cut until July, August or September depending on the fertility and wetness of the soil and the species which have grown. A wildflower meadow should last many years, provided the wildflower species were correctly established, weeds were controlled and the meadow was cut and the cut material removed and occasional 'Gaps' are created. If not contact DBN. Persistence if unmanaged: Low to moderate. Tolerance of Cutting: High after second year. General Cutting Time: Mid to end of Summer and again in spring. Specific Cutting Time: Wait 3 weeks until after the last flush of flowers fade away, after seeds set. Management: Control grasses and weeds until well established. Accept any normal non-invasive weeds as they provide cover, once the sward is established, digging, spot spraying or weed wiping can be used to eliminate problem species. Control weeds, especially Creeping Buttercup, if Creeping Buttercup is present cut this meadow in May in year two. The third year is the critical year to maintain this meadow as scutch grass, creeping thistle, nettle and dock will try to dominate as the growing conditions are ideal for such unwanted species. Most species in this mixture are 'Browse' resistant. 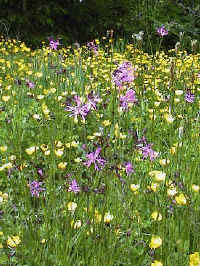 Meadow Mixtures are designed to grow on soil in specific situations. This range of seed mixture is ideal for those concerned with species suitability, composition and performance to be attractive, encourage wildlife and local biodiversity. If these mixtures are suitable for your situation, they offer good value and if given time, develop into a flora that will persist if properly maintained. Your purchase: Contributes to DBN's work of creating crops of Conservation Grade - Native Origin Wildflora. You help us to inform and pay land-owners to manage native species and to assist DBN in handing on our heritage for another generation. By growing (some will be difficult) these and all other species, you directly help to conserve national and global Biodiversity and protect wildlife. You should also consider yourself another Irish wildflower grower.